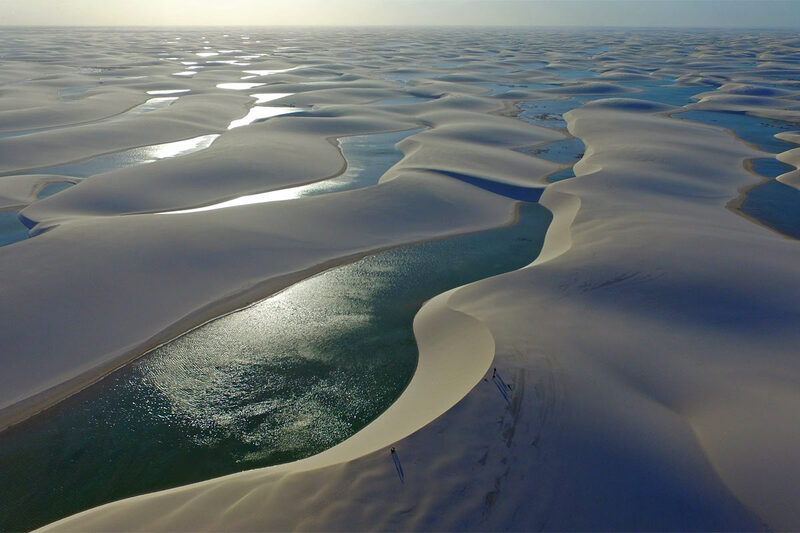 The Lençóis Maranhenses National Park is considered the "Brazilian Sahara" for its 155,000 hectares dune desert which extends itself from the continent towards the sea. 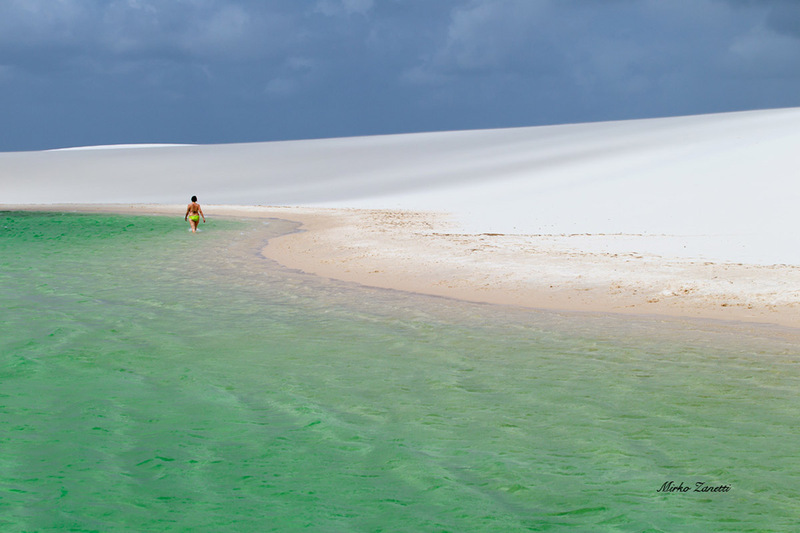 However, in the Lençóis it rains enough to forms hundreds of emerald-green lagoons in the middle of gigantic dunes. The conventional entrance door to this location is through the city of Barreirinhas located at 4 hours driving from São Luís. You'll have a boat trip on the Preguiças River, crossing the Lençois from Barreirinhas to the Atlantic Ocean. The river reaches the sea in Atins, a remote fishing colony, perfect to eat fish and shrimp. It is surrounded by native vegetation, as the palm threes and coconuts. From the top of a lighthouse, you will see the dunes reaching the Ocean from one of the best views of the park! 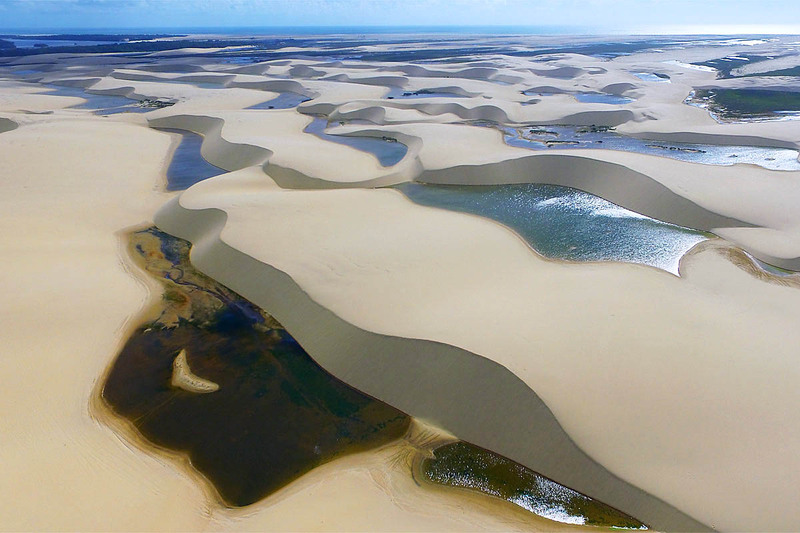 Departure from your hotel in São Luís* to the town of Barreirinhas (the entrance door to the "Lençóis Maranhenses" National Park) by a 4x4 car we will travel along 270 km of paved road, the estimated duration of the trip is 4:30 hours. Accommodation. At 2:00pm transfer by 4x4 up to the Great Lençois where we enter in the Blue Lagoon circuit, that includes the Lagoa Azul (Blue Lagoon), Lagoa do Peixe, Lagoa Esmeralda, Lagoa Preguiça and Lagoa da Paz. 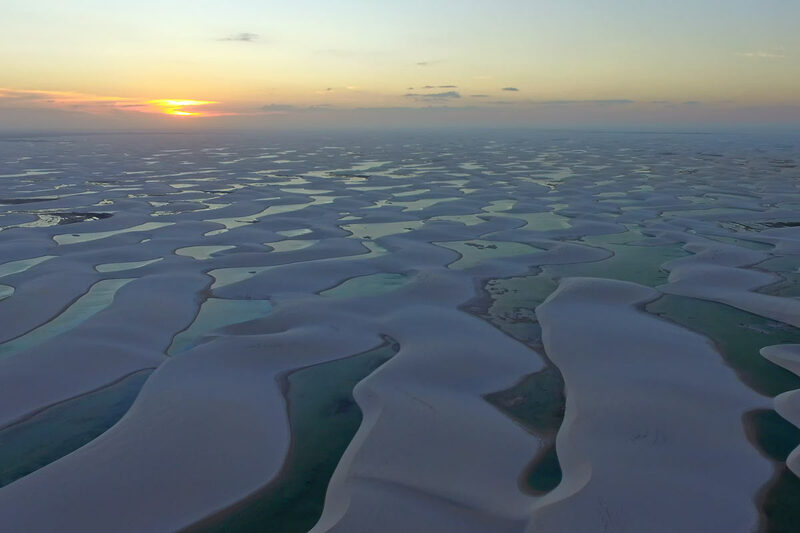 Each lagoon has different colours and shapes, the guide will decide the best lagoons to visit according to the period of the year. The return to Barreirinhas is planned for about 6:00pm. Overnight at Barreirinhas. 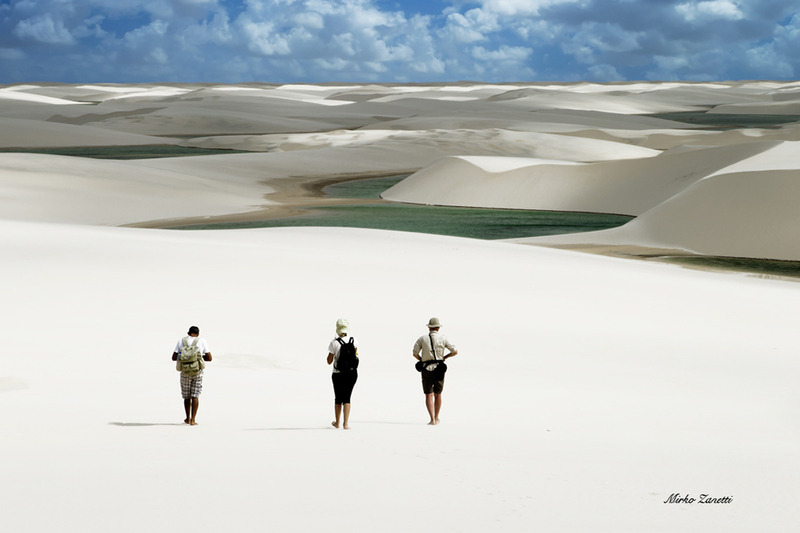 Departure from Barreirinhas at 08:30am by a 4x4 vehicle to the Lençóis Maranhenses National Park (PNLM) for about 1:30 hours passing through Atins beach and the meeting of the Preguiças River with the Atlantic Ocean. From Canto do Atins we walk in for about 30 minutes up to the Epoca Lagoon where we stop for rest and bath. On the way back, we will stop in a restaurant for lunch (there are only 2 restaurant options, the lunch is not included in the package). After lunch you can rest in the hammocks and enjoy a free time before driving back to Barreirinhas at 4:00pm. Free night at Barreirinhas. Departure from Barreirinhas port at 8:30am by a motor boat you´ll go down the river Preguiças toward the ocean. The first stop is at Vassouras to see the Small "Lençóis" and the local fauna in the Tent of the Monkeys (Tenda dos Macacos). The second stop is at Mandacaru, a small village of fishermen, where from the top of a lighthouse (Farol da Preguiça) you will have a beautiful view over the Lençóis Maranhenses, the Preguiça River and the vast forest still preserved. Transfer by boat to Caburé beach where you can lunch (not included) and bath in the ocean or in the river. At 4:00pm drive back to São Luis (260km / 4hours) and drop off to your hotel in the city (non included in this offer).